Hey, I'm In Guitar Player Magazine! Just found out I'm in Guitar Player Magazine, New Products 2011 Issue. I was reading through the magazine and came to the Facebook Court of Opinion on page 22. I had commented on a question on GPs Facebook page a while back regarding who inspired my guitar of choice. 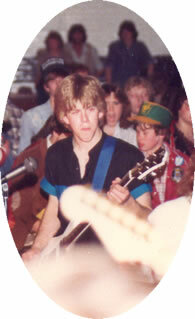 I mentioned remembering Craig Chaquico (Jefferson Starship) playing his BC Rich Mockingbird. Once I saw that shape, I was hooked. That led me to eventually having my own Mockingbird. Mine was a tobacco sunburst beauty. This was back in the day before the company started mass producing guitars overseas. All the BCs were hand-made here in the US then. I don't have my Mockingbird anymore, but I do have a Rich Bich, and it's currently my main axe. Love the BCs!